A reader named Haley wrote and asked if she could interview me for a school project. Here are her questions, my answers, and the email she wrote after it was all done. I include that because I had thought about her questions a lot and I was glad she had noticed that and appreciated it! I was also impressed that she wrote such a nice thank you note. 1. What made you decide to be an author? I've wanted to be a writer ever since I can remember -- probably, because I loved books (and talking!) so much....but I've wanted to be one since before my memories even start. See answer to next question. writing? What type have you had? Writing is something you learn by loving words, reading, listening to people talk, being curious, being interested in other people, writing and rewriting and rewriting, more times than you can imagine. I started writing stories when I was seven and I've been writing ever since. 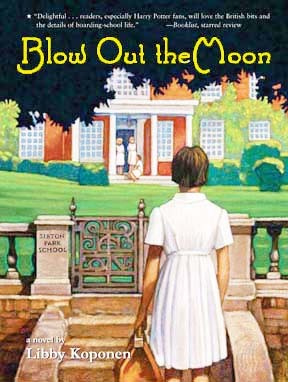 I was lucky enough to have been given a very good education, in England (well, you know about the Sibton Park part of my education from BLOW OUT THE MOON) - and at my boarding school in America, Kent. I also went to graduate school in writing, but I now think that was a complete waste of time and money - I would have been better off going to live in another country for awhile or just using the money I saved for graduate school to live on later, when I had become a better writer and could have used the time! "It's her favorite toy, she takes it with her everywhere. Do you think that's significant?" I wasn't an early reader, but even before I could read myself (I used to memorize books and then say the words outloud, pretending I was reading: I knew where to turn the pages, too). Once I did start reading to myself, I loved to do it and read (and wrote stories) constantly. THAT, more than any formal schooling, was probably my training. I like writing itself, getting emails from kids -- in fact, I LOVE getting letters from children who have read my book, and going to schools for visits. These are probably my favorite parts: they make all the unfun parts seem worthwhile. Also I have to admit that since it's something I've wanted all my life, I still get a huge thrill whenever anyone calls me an author! I hate marketing: trying to sell my book. "Marketing" means all the things that authors do to get people to buy their books - some authors spend most of their time doing these things (I don't). I should spend more time doing the marketing. 4. What other people do you work most closely with? I don't really work closely with anyone: this is one thing about being a writer that some people don't like. I love it! When I write, I do it by myself, at home. Later I work with editors (I talk about that a lot in the Education Oasis interview so I won't repeat it all here). 5. What are some careers that are related to writing? Writing books isn't a career, with steps and training and degrees, or a job you apply for. You just do it because you love it. You try for a long time and if you're good at it and work hard, you get better; and then if you're lucky, people want what you write. 6. Please describe the publishing process. I'm not sure what you mean - how do you get published? There is no one answer to that question. It's really, really hard, since most publishers now don't even consider manuscripts that are just sent to them by unknown people. These are put on what is called "the slush pile" - one editor told me once that just for fun, she once asked her assistant to count how many unsolicited manuscripts they received every week: it was several hundred. In the twenty years that editor was at that company, they published 12 of these. So, the odds are against getting published. 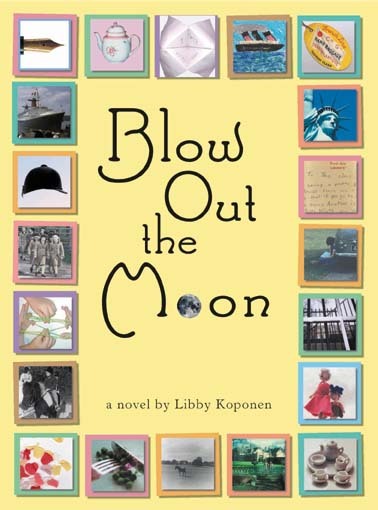 BLOW OUT THE MOON got published (I think) because I put the whole book on the Web and a lot of kids wrote to me about it. When I wrote to publishers asking if they would like to see the book, I sent copies of those letters. I was also lucky that an editor READ my letter (lots of times, no one does!) and thought my book sounded interesting. She asked me to send it to her and I did. ..on some books, I get 10% of the list price (the price people pay in stores). On some I get 5%. On some I don't get anything. Sometimes, royalties are on a sliding scale - they go up after a certain number of copies have been sold. Often, when a publisher agrees to publish a book, they give the author what is called an "advance against royalties," or "advance." If, for example, the advance is $5000, the first $5,000 of the author's royalties go to the publisher; the author only gets royalty checks after the advance has been paid back. Most novels never earn back the advance - the publisher loses money on the book and the author never gets any money beyond the initial advance. job? & 7. What is your workplace like (if you have one)? I have lots of pictures I like around me, and pictures kids have drawn for me, and a pebble from Jane Austen's driveway under my desk (on the sliding thing that's supposed to hold the keyboard). 10. Does any author inspire you? Why? --because they write so well and their characters are so real and believable. They both make me laugh, too. YES! (and if you only put one thing from this interview, please put this answer!) Stay curious and interested in lots of things: then you'll always have something interesting to say. Read everything - especially, good books. Think about what makes them good, learn to tell the difference between what you like and what is good. Look words up in the dictionary a lot. Care passionately about grammar and words - how they sound, what they mean. Have something to say - if you have nothing to say, what's the point of writing? Be patient, both in waiting to have something to say and in working hard to say it was well as you can -- write and then rewrite and rewrite and don't stop until what you've expressed your ideas as well and as clearly as you can. Don't expect to make much (or any, at first!) money from your writing - and do plan to support yourself in some other way, ideally, one that gives you the time and energy to write. Good luck! (and to get published, you will need good luck in addition to hard work and talent and something to say). sources of information about authors? Read writers' autobiographies - especially autobiographies written by writers you really like . The ones that you will probably find the most interesting are in the Q&A from a kids' reading group and the interview with Education Oasis. I can't wait to read your next book! The paperback will be in bookstores starting in May. is available now from Amazon and Barnes and Noble.